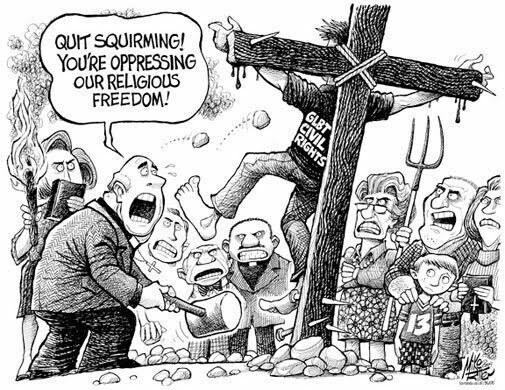 Jesus embodies GLBT civil rights as he is crucified by Christian fanatics in a political cartoon from Wipeout Homophobia on Facebook. The cartoon uses art and humor to support LGBT equality and poke fun at the rightwing Christians who oppose our civil rights. “Quit squirming! You’re oppressing our religious freedom!” shouts the priest who nailed Jesus to the cross. Jesus wears a shirt labeled “GLBT civil rights.” He’s not passively accepting crucifixion, but kicks at the angry mob carrying a torch, a pitchfork and Bibles. The cartoon does a great job of illustrating how fundamentalists seem to feel threatened by the idea of equality for lesbian, gay, bisexual and transgender people. LGBT Christians really drive them crazy! Update on Feb. 24, 2014: It took years to track down the name of the artist, but he was finally identified today by an anonymous source. I am in the process of contacting Mike Ritter for permission to share his cartoon here. The irony is that it takes a minority of Christians and uses them to create a stereotype. This is something the LGBT community should know all about. For some reason in this country, you only have to be politically correct to people who vote democrat. The anonymous commenter makes a valid point that this cartoon stereotypes religious people by showing them as ugly caricatures crucifying LGBT civil rights. 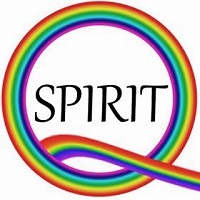 Please remember the context of this blog -- it is a spirituality blog inspired by Jesus. Thus it is a form of self-criticism to post a cartoon here that shows the flaws of Christians. Yes, we must beware not to become the oppressors. This is exactly what we are dealing with in Colorado today. Focus on the Family has submitted a constitutional amendment that does exactly as this cartoon portrays. Hang in there, David! It is brave gay pastors like you who will make a difference. I too am trying to track down this artist. Did you have any luck finding his/her name? Hi Craig. Unfortunately I have not been able to track down the name of the artist who did this amazing cartoon of LGBT rights on the cross. This continues to be one of my all-time most popular posts, and I really wish I could give credit to the artist. Please let me know if you find out his or her name. A note to artists: Please sign your name bigger! I know you were trying to find out where it originated. Thanks, Don, but I checked your link carefully and I think the Matt Wuerker credit goes with the cartoon below it, not with this cartoon. If you compare the signatures, you will see that this signature does not look like Matt Wuerker’s. They didn’t credit this cartoon. So the search for the artist continues! Mike Ritter is the name of the cartoonist. Thanks to the anonymous source for identifying the cartoonist as Mike Ritter! It looks like you are right. I will add his name to the main post and contact him for permission to keep his “Quit Squirming” cartoon online here. This is one of the all-time most popular posts at Jesus in Love, so I hope I can keep displaying it. For others trying to reach the artist, Mike Ritter seems to be associated with Torstar Syndication Services , but I haven’t yet confirmed whether he is still there. Mary and Martha: Sisters or lesbian couple?